Hard to believe that it's been well over a year since the passing of Faith No More's former singer Chuck Mosley. The wounds are still fresh, due in no small part to that fact that he was in the midst of a really successful grassroots comeback. Douglas Esper did much (and continues to do much) to bring the talent of Chuck Mosley to the masses. In a move that must have seemed insane to outsiders, he picked up a conga drum and threw Chuck and a guitar into a car and hit the road. They would eventually tour both the United States and England extensively, expand the set, and build what became the Chuck Mosley Band. The idea was brilliant. Chuck's was a BIG personality packed with charm and humor. It is no exaggeration when I say that he would engage everyone in the room as if they were old friends. 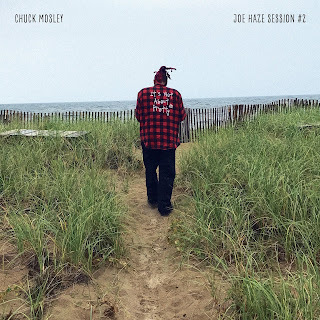 The tour(s) showed fans old and new the lesser-known side of Chuck Mosley's music, and just how wonderful it could be. It was during this flood of activity that they would record The Joe Haze Session #2. The Joe Haze Session #2 is an upcoming limited edition Record Store Day exclusive (released by blocGLOBAL and distributed by Traffic Entertainment Group) whose announcement has come as something of a surprise to many of us. While it was well publicized that Chuck and crew recorded with famed FNM producer Matt Wallace (the sessions of which remain unreleased at the moment) and Douglas had put the call out that they were looking to demo at other studios throughout their tour, few had any idea that this cool little record would happen. Side A is a very thoughtful and powerful cover of The Family's "Nothing Compares 2 U". Raw and authentic as hell. A real display of the subtle power of both the man's voice and his understated guitar work. Chuck Mosley makes the Prince-penned tune his own, much as Sinead O'Conner did in 1990 to great acclaim. Does Chuck reach those lofty heights? He wasn't hitting for them. This is just an authentic performance of a song he'd adopted and loved. The production is stripped-down. A clean, but certainly not antiseptic, capturing of a man who'd been on the road for some time. Laid-bare and fragile, but with light shining through it. While "Nothing Compares 2 U" is clearly the single of the two, fans will no doubt be interested in Side B's cover tune, "Take This Bottle", a Faith No More ditty recorded years after Chuck had left the band. Like "Nothing...", it was a regular part of the Chuck Mosley Band's set during the ReIntroduce Yourself Tour. A cheeky move to be sure, covering a song by the band that fired you and originally recorded by your replacement. It's a fun little idea that's taken on a life of it's own. A perfect match and foil to the record's other side. It's a "bigger" sounding song complete with Douglas Esper's drum slapping and back-up singers. Chuck took "TTB" and somehow managed to make it sound autobiographical. Douglas' vocal take on the second verse is Patton-esque for sure, but goes so well with Chuck's when they come together. Chuck Mosley was a fantastic collaborator who understood the give-and-take dynamics of a duet. Both songs are excellent versions of works we know and love delivered beautifully. Joe Haze Session #2 will likely have fans salivating for more, but it stands on its own as a short, cool, and cohesive statement. And it's pretty too. If you're still hungry for the "lighter" side of Chuck Mosley (and Douglas Esper), I highly recommend Indoria's 2016 album, You'll Never Make The Six. If you want the "LOUDER" side of Chuck Mosley, I highly recommend Primitive Race's 2017 album Soul Pretender.